I like to think I'm a man of many talents, but this doesn't mean that I've given up trying new things. This week I've been dabbling in mysterious black arts in an attempt to hone my psychic powers, and you the BT readers are going to be among the first of my victims, *cough* I mean test subjects of course. So make sure you're sitting comfortably, touch the BT logo in the top left hand corner of this window with the index finger on your left hand and concentrate on your favourite colour. Hold it right there, it's coming to me... nearly, ah-ha! It's BLUE right? How amazing am I? 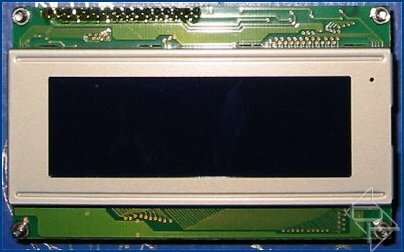 Well now I bet you'll be wanting an LCD to match that favourite colour of yours, and while various blue LCD's have been available in smaller sizes for a while now, 20x4 displays have been difficult to source. 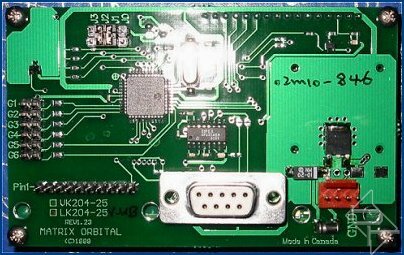 Enter the new LK204-25-WB-V from Matrix Orbital. Identical in nearly all ways to many of Matrix Orbital's other 204-25 displays, the only really unique feature of the LK204-25-WB-V is the display's colour. As far as serial character LCD's go this display is about as feature packed as they come. The LCD itself looks like an inverted version of the LK-204-25-PC, in that it is backlit from the side using two white LED's. The blue background is white light shining through crossed polarises. Matrix Orbital have set the display's polarising sheet to be in phase with the display panel, so that text appears white and contrast is optimised. Looks very nice doesn't it? The rectangles around each character which can be seen in the pictures above are only visible when looking at the display from face on (at normal incidence); from all other angles the display has a nice even blue background (providing the contrast has been set correctly!). There's not really a lot to say in this review. By now you should know that Matrix Orbital displays are of the highest quality, so given that the only new feature brought forward by this display is its colour, this is the only real feature under test. Unlike many blue displays the LK204-25-WB-V has good contrast, so it is never difficult to read and the blue display is certainly attractive. Another cracking display from Matrix Orbital then. Along side the display reviewed here you can also buy the LCD2041-WB-V (1 GPO, no keypad) for $61.90 USD and both displays with normal 5VDC inputs for a $2 USD discount.